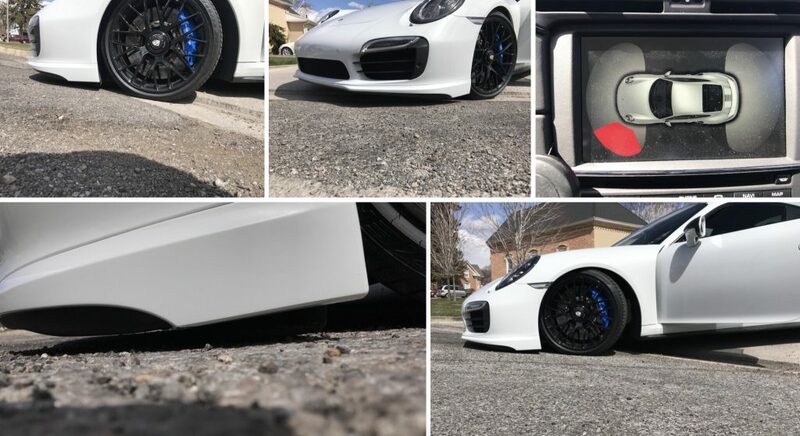 This category contains posts about my 2016 Turbo S. Below are posts about projects, repairs, and my 911 “adventures.” Check out my Turbo S info page! I’m doing this blog post before I make a YouTube video this time. A lot of my posts these days seem pretty lazy to me. I just pop up a video and blurt out a few thoughts after the fact. Back in the good old days (when I didn’t make videos) I feel like my posts were a bit more thoughtful. That’s what I’m going for here. When I had my Corvette I remember one of the things that really bothered me was the wheel gap.It was such a big deal to me that I contemplated spending about $3K on drop spindles (not including any installation costs). You can drop a corvette up to a 1/2″ on the car’s stock lowering bolts but knew I wanted to go at least an inch. Of course that didn’t matter because I ended up selling the car long before I got around to any mods like that. Quite a wheel gap you have there! Fast forward a year or so and dropping the car was on my radar. After doing some research I settled on GMG’s lowering springs and ordered a set. I debated about whether or not to install them for nearly a year. My primary concerns were threefold: 1) How would the springs would affect the ride? 2) I felt stressed out about rubbing the front of the car when I drove over dips and uneven roads* (I have had other lowered cars and have done my fair share of nose grinding). 3) Would the stock wheels look okay on a lowered chassis (the centerlock offsets place the wheels a few mm inside of the fenders). *This is a big deal on the 991 Turbo series because it has a retracting front spoiler. If you rubbed the underside of the car’s nose you’d actually be grinding the spoiler on the ground. Eventually I decided to just go for it. I hoped the retractable front spoiler design would allow the car to have the clearance it needed. And who cares about ride quality when your car could look a little nastier. Plus if things didn’t looks right it would be a great excuse to get a new set of wheels. Can I get an “Amen”? The guys @ Ken Garff were nice enough to take a few pictures of the install for me along the way. Don’t forget- when you have these installed you need to realign the car! I dropped it off at my dealer on Monday and picked it up on my birthday a few days later. The install went well and when they did the alignment everything was within spec. I couldn’t believe how much of a visual difference the drop made (it ended up being abut an inch). Somehow it changed the car’s whole stance. The reaction at the dealer seemed very positive- several people there expressed how much they liked the modified look. This is the ride height difference. The bottom of the wheels here are lined up with each other and you can see the gap difference which ended up being about an inch. From the video: Turns out that some dips are pretty tough to get through. All in all, 99% of the places I drive have been fine (I even went out and did some late night testing of areas where I know I’ll be driving the car). As many of you know I am a carbon fiber addict (and apologize for saying this over and over and over… but the first step to overcoming an addiction is admitting you have one). I have been looking for ways to add a little more carbon fiber to the front of the car. The headlight rings have been on my radar for awhile but I resisted the urge because- and this may sound crazy- I don’t like to add carbon fiber just for the sake of adding carbon fiber. It’s nice when there’s some kind of functional benefit. But who am I kidding… I loved the set I had on my 997 so I knew I would like these too. This was a fairly inexpensive set and I’m pleased with it, for what it is. The fitment is good (one side was slightly warped but I was able to get that sorted out alright) the quality acceptable and they look great. I had to use my own adhesive which was fine (all of this is covered in the installation video). The one thing I’d nitpick is that the weaves weren’t complimentary. Typically, as I explain in my video, I’d expect to see the weaves running in opposite directions where there is a distinct left and right piece. Having them run in the same direction isn’t really much of an issue and my guess is that most people wouldn’t even notice this discrepancy. I thought it would bother me but having had them on for a week it’s not an issue. Overall I think they are a nice addition. It’s a good way to get some carbon fiber on the forward facing end of the car. It’s a non-permanent addition too – if I find a nicer set down the road I should be able to swap them out with no issues. The parts were ordered from eBay seller dpro6097 (the eBay division of Darwin Pro). Customer service was responsive when I asked them about the issue I was having with a warped part. I love the lane change assist in my wife’s Yukon. When they added the same feature to the new generation of 991 cars I lusted a bit. Adding it wasn’t an option so I opted for the next best thing (although as I use it I’m starting to think that it is the best thing): Aspheric Mirrors! Function: most of the mirror is flat and works like a typical side view mirror. However, the outer edges are concave and provide a larger, albeit distorted, field of view. You get a few more feet of side vision and this completely eliminates the blind spot on both the left and right as cars come from behind. As a car passes you can see that car in the side mirror all the way until it becomes visible in your actual peripheral vision. It works extremely well. Additionally you get a much larger field of view behind your car which makes it easier to back out of a parking spot. Installation: As far as modifications go this one is among the easiest. The mirrors simply snap out of and into place. The only danger here is that if you’re not careful you could potentially crack the mirror. My video below demonstrates the removal, installation and function of the aspheric mirrors on the 991 platform. Cost: The mirrors are expensive- there’s no question about it. The only real consideration here is how much do you want to see? Realistically you only need the driver mirror as it’s difficult to crane your neck around and look behind you. The passenger mirror is not absolutely necessary but I wanted my mirrors to match (cause I’m a freak like that). I felt they were worth it to me personally because I have struggled with blind spots and have difficulty turning my neck (due to an injury). I admit I am perpetually looking for ways to modify my vehicles so I don’t really need a good reason to do stuff like this. However, having done it I’m very happy with the upgrade and would definitely recommend it. It’s good enough that I would probably consider skipping the lane change assist feature on a future 991 and simply adding aspheric mirrors. Shocking, i’m sure. I have lusted after the MACarbon custom steering wheels for long time. Last year I decided that I was ready. No matter the cost, no matter the wait… I was all in. I submitted the order for my wheel in October and hoped it would come in time for Christmas (my ignorance knew no bounds). I worked with John, who was fantastic. He suggested the white stitching on the leather portion of the wheel and I love how everything turned out. The wheel was completely worth the wait! I’ve purposefully tried to balance the interior and not get too carbon fiber crazy (real crazy). I’ve kept a good mix of Aluminum present (i.e. door pulls, pedals, shift knob) and so I left the center of the wheel silver. But the carbon fiber dash accents flow perfectly with the top and bottom of the wheel, which are also carbon fiber. All in all I feel like it’s incredibly complimentary and perfectly inline with the vision I have for the car. The only drawback so far is that the carbon fiber parts of the steering wheel do get a little colder than the leather (not great on wintry days)… Still one of my all time favorite upgrades! I really enjoy the process of customizing my car. I feel like each modification makes my car into something more one of a kind and that uniqueness beings a lot of satisfaction. I’m glad I did’t shy away from carbon fiber this time around. Also, I can’t say enough nice things about having a cool dealer right up the street- infinitely convenient. 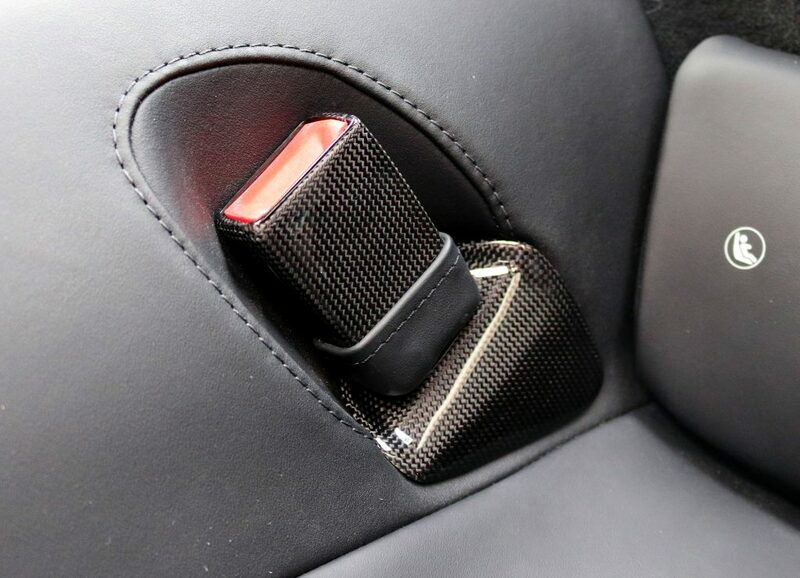 The first time I laid eyes on these carbon fiber seat belt buckles (from MACarbon) I knew I’d have them in my car one day. It was a bit of a mental fight- they’re not cheap and the buckles I already had worked quite well- but the fever from my mod-bug infection was at an all time high. I’m pretty sure my order for these parts was placed in September of 2017! But good things come to those who wait, right? 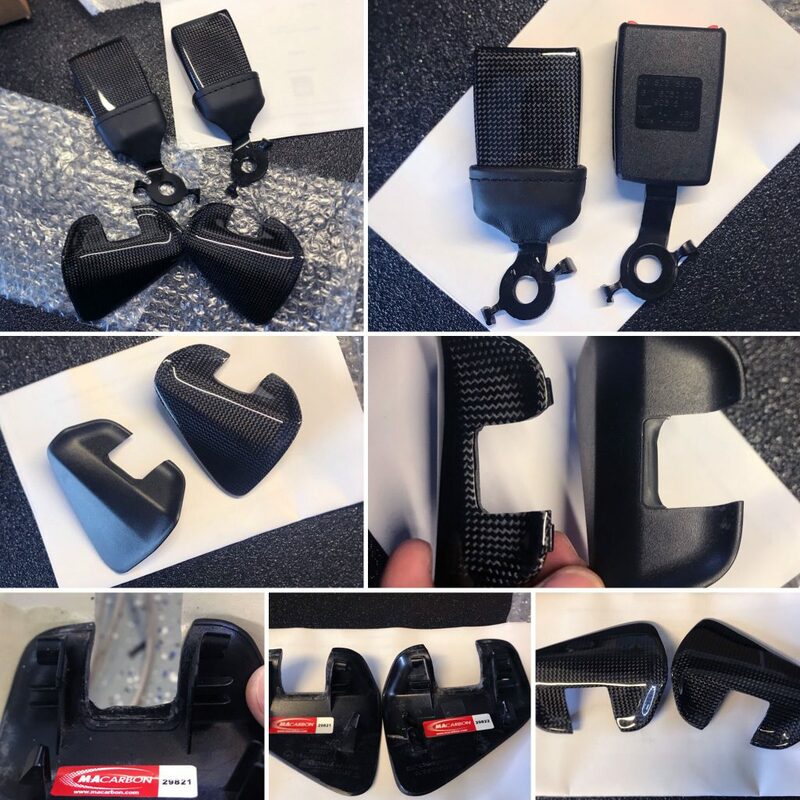 These carbon fiber covered buckles really step things up a notch as these parts are surprisingly visible (not so much in the back, I suppose). The leather covers on the front buckles looks great and hides the wires that run from the buckle into the seat. The rear buckles have a nice leather base and then that’s framed by the carbon fiber trim- a good looking setup! I originally had these on my “to buy” list with a note that said “what is wrong with you?” This was a hard purchase to justify but I managed to push it through and I’m happy with the results. It’s the little things (“Is this guy serious right now? ?” Half). Quick comparison of new parts with old parts. Rear seat belt installation is really easy… unless your pieces aren’t made quite right. Such was the case with my shipment. The surrounds needed to have some of the carbon fiber removed. MACarbon kindly offered to pay to have them returned for a fix but I told them I could take care of it. It was no problem- I milled them down a bit with my trusty Dremmel and I got the parts installed in no time. I love car mods. And I especially love car stereo mods. My car came with the Burmester Stereo option (a step up from the Bose which itself is a step up from the factory offering). Overall I have been very happy with the Burmester’s performance. However, having pulled out various components I knew there was some room for improvement. When Musicar began offering their custom tweeter upgrade – built on a Dynaudio Esotech MD 102 platform – I knew I had to try it. The speakers and custom mounting bracket are first class quality. Installation is straightforward and, with the exception of one tricky clip, quite painless. The MD 102’s are definitive upgrade over the Burmester ribbon tweeters. Vastly improved sound fill, elimination of the piercing harshness that plagued the ribbon tweeters at high volumes and, overall, a higher level of detail. Don’t get me wrong- the Burmester tweeters are excellent. But the Dynaudio tweeters are exceptional. Everyone universally agrees that this upgrade is a “necessity” for those with factory or Bose stereos. But I’d recommend it as a solid upgrade to anyone with a Burmester system as well (worst case it’s easily reversible). I think I mentioned in my previous 6-month review that the Burmester didn’t give me the tingles. Well I got some now. Thanks Nick & Musicar! All that being said, part of me now feels like a shark that’s smelled blood. I’m shopping around for possible subwoofer and amplifier upgrades. Sigh. I think it would be fun to be able to listen to all the stereos I’ve tweaked with over the years. I’m sure I remember some being much better than they really were. 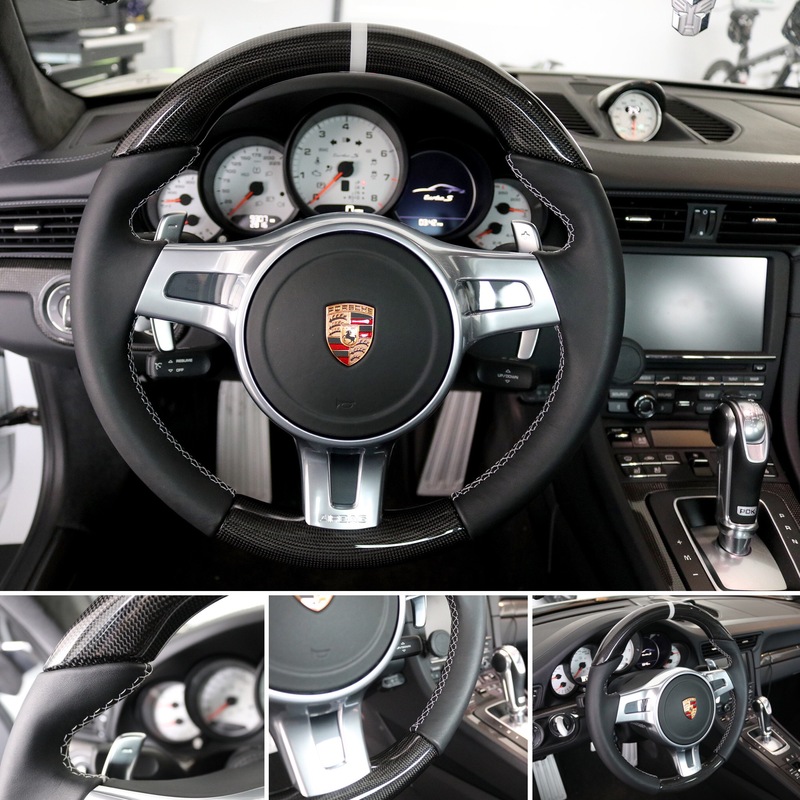 Porsche 991 Steering Column in Leather. Thank you, Nick Murray. Let me guess? You had standard steering column trim and you felt great about it. But then you watched one of Nick Murray’s YouTube video and found out that you needed a leather steering column to be happy. It happened to me too! I tried to ignore the feelings at first but every time I hopped into my car there was this plastic part staring back at me. I finally bit the bullet, ordered the leather part and installed it. My experience and the installation process are detailed in the video below. In summary: it took nearly three months to get this thing installed, despite the fact that the actual installation was fairly easy. For the most part I’m happy with the results and I agree with Nick that the leather on the steering column makes a nice visual difference. As with almost everything I buy for my car I can’t say “it was worth it” and sleep well at night. I can’t say I’ve spent a ton of time worrying about things hitting my radiators. It was obvious when I periodically cleaned them that they were getting dinged now and then by debris. My local dealer had offered me a solution that resembled something that looking like chicken wire (at least that’s how I remember it). Pass. And then one day some people on a forum were talking about their ZunSport Grills and how happy they were with the product. I had a peek and they looked good! Great price (a substantial discount is offered with a forum code) including free shipping. “Easy install” (no bumper removal). I went ahead and ordered a set from Zunsport and had them just three days later! The box was a little crushed, but everything was still in fairly good order. Install: I actually found a couple parts fairly difficult to install. However, I was able to work my way through the issues with only minimal drama. Fit: With the possible exception of the top right grill everything fit pretty well. The aforementioned grill doesn’t seem to hold in place well but I think it may have something to do with a clip that got bent during shipping (I’ll be able to sort it out). I have been for a couple of drives so far and they have remained in place just fine. Look: I really like them. I think the grills enhance the front of the car. It adds a bit of additional black makes her (him? Still can’t figure this out) look a little meaner. Functionality: I think the grills will do a pretty good job of deflecting a rock or road debris. I’ll have to pay attention to see how chipped up they get over time. Incidentally, that’s another reason I really like them- very simple to replace and / or remove for cleaning. Some have worried they will affect air flow the car. Time will tell. Overall, based on my three days of owning them I would give them a thumbs up!